When Penny Gionta first introduced her kids to skating, she was hoping a winter extra-curricular activity would enrich their lives while at the same time keep them away from the television. She never imagined her middle son, Brian, would take such a liking to hockey. But he was captivated by the game. There was never enough time to skate, never enough time to dart around the ice with a stick and puck. And never any way to see over the boards. Through Mites, Squirts and even to Peewees, the boards were always taller than Brian Gionta. Not that being the littlest guy on the ice ever mattered to Gionta or his first coaches in Rochester, N.Y. His skill level always prompted league organizers to push him up one age class. After all, hockey isn’t like the rollercoaster at Six Flags. There’s no height requirement. So when Gionta should have played Mite minor, he was in Mite major. When his age group was playing Mite major, he played Squirt minor. And the year after, he was in Squirt major. Ah, but then along came Peewees. Suddenly checking became a part of the game. Suddenly Gionta was in line for the rollercoaster and the attendant shooed him away. Ever see a 12-year-old hockey player, a kid with undeniable desire to succeed, throw a tantrum? It’s not pretty. “I was not happy at all,” Gionta says, remembering the moment as if it was yesterday, even though 18 years have passed. That blanket “you’re too little” judgment became an all-too-familiar refrain. Hicks even told Penny and Sam Gionta that some NCAA school would be giving their son a full-ride scholarship. He saw Brian battle, scoot and dart through and around defenders to score 104 goals and 218 points in 101 games over two seasons. Once at Boston College, the early-years doubts were hard to imagine. He scored 123 goals and 232 points in 164 games during his four-year collegiate career from 1997-98 to 2000-01. He was a three-time First Team NCAA East All-American and twice a Hobey Baker Award finalist. The New Jersey Devils were convinced of what he could do by his freshman year. They drafted Gionta in the third round, 82nd overall, in 1998. 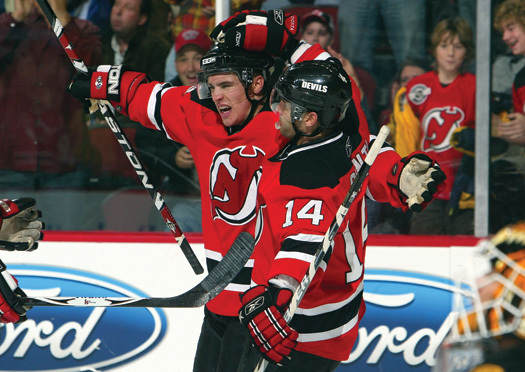 In his fourth NHL season, 2005-06, he played in all 82 games and set a Devils franchise record with 48 goals. “We traded up [in the draft] to take Brian Gionta,” says David Conte, the executive vice president of hockey operations for the Devils and a draft guru. So does another Boston College product, Nathan Gerbe of Oxford, Mich. After having a solid training camp with the Buffalo Sabres, Gerbe started this season with the American Hockey League’s Portland Pirates and was piling up goals through the first month of the season. The Sabres know they have a steal out of the draft after selecting him in the fifth round (142nd overall) in 2005. So did everyone else. But the 2005 draft was before the NHL decided to let the little guy play. 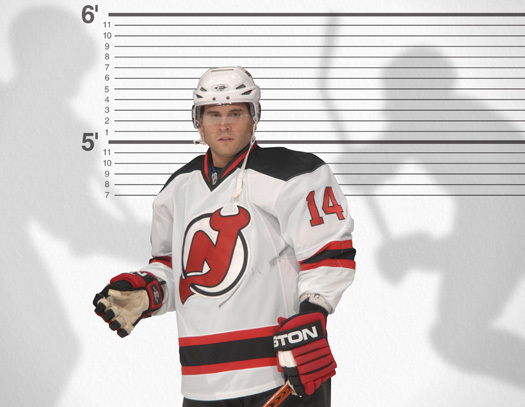 Gerbe stands just 5-foot-5 and weighs 160 pounds. He was just what NHL scouts didn’t want in the pre-lockout era of clutch-and-grab, hug-and-hold hockey. “Clearly there has always been a prejudice, but there’s less of that prejudice now,” Conte says. The bias was justified, though. Turn on the NHL Network or ESPN Classic when playoff games from the 1990s or early 2000s are airing. You’ll wonder why they’re even wearing skates. “You can look at the draft picks by some teams and they had nothing but big guys,” Regier says. “I was watching Detroit-Winnipeg one night and no one could go anywhere,” Regier says. Zach Parise (5-foot-11) and Brian Gionta (5-foot-7) are two big reasons why the New Jersey Devils are among the top teams in the NHL. Indeed, that’s exactly what Tampa Bay Lightning winger Martin St. Louis told the NHL as the lockout was ending, when players and executives decided to implement the crackdown on stick fouls and interference. That’s not the case today. 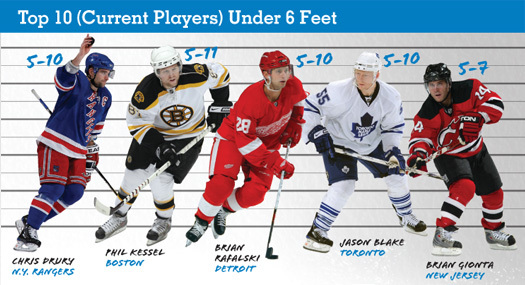 Players like Gionta, Daniel Briere, Derek Roy and Brett Sterling are as valuable as the 6-foot-4, 225-pound winger. Gerbe will soon be in Buffalo. Other mighty Mites have earned NHL and AHL contracts, like 5-8, 165-pound Marty Sertich of Coleraine, Minn.
Sertich, the 2005 Hobey Baker Award winner while at Colorado College, plays for the AHL’s Lake Erie Monsters with other Colorado Avalanche prospects. He was undrafted and signed as a free agent. Which is why he didn’t know if hockey could become a vocation after college. Like so many others, however, Sertich refused to let a stereotype control his life. Karl Goehring plays with the same inner desire. He’s a goalie, but at 5-foot-6 and 160 pounds, he has often been bypassed because he’s supposedly too small. Goehring was a star at the University of North Dakota from 1997-98 through 2000-01. Now in his eighth AHL season, he knows NHL teams believe he’s too small to play. But he scoffs at the popular belief that small goalies wear down physically over the course of a busy season. “There are too many things you can do to keep your body fresh in terms of nutrition, rest, sleep habits,” Goehring says. That seems to be a popular message among players of various sizes and skill levels. “There’s no way I could compete if I didn’t put in time in the weight room during the summer,” Sertich says. Indeed, dedication is so important to success. So, too, is the determination to overcome. “If you’re short on stature, you can’t be short on character,” Conte says. When Regier watched Gerbe, he didn’t see a tiny hockey player. He saw a winner. 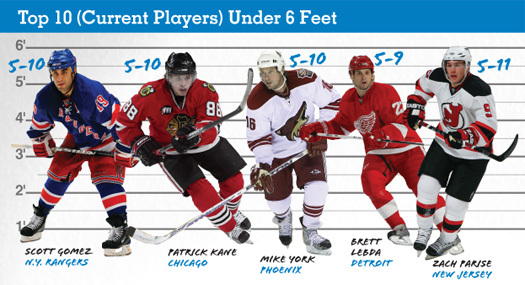 In essence, you’re only little if you think you are, as Gerbe and Gionta have proven. That fire burned big. Real big. Gerbe admits that seeing Gionta dominate at Boston College, then shine on the NHL stage, gave him even more of a reason not to give up. “It gives you hope, it gives you motivation,” Gerbe says. Gionta knows he’s a role model for smallish kids in youth hockey programs throughout the country, too. Kids write him letters. When he’s skating in the summer at home in Rochester, or making a public appearance through the Devils, youngsters flock. “For sure, there have been plenty of small kids in the rink that come up to you and say, ‘I enjoy watching you play, you give me hope,’ ” Gionta says. Kevin Oklobzija covers hockey for the Rochester (N.Y.) Democrat & Chronicle.